In the current arms race to find the cleverest beer puns, there are bound to be a few naming overlaps -- I mean, how many times can society play off of the word "hops" (especially since IPAs are literally everywhere) and not have multiple "Hopscotch"es? But one of the symptoms of America's craft beer explosion is exactly that: brewers are giving their beers the same names. And it turns out there aren't many unclaimed ones left. NPR reports that there have been multiple instances of talks between breweries in separate regions over beers whose identical names were arrived at independently, but whose distribution areas were large enough to merit discussion of name changes. For example, Avery (Colorado) and Russian River (California) found out they both had a beer named "Salvation," but decided to coexist peacefully and combine their beers into a blend (called "Collaboration Not Litigation"). Others, like SweetWater and Lagunitas, were both using the "420" moniker (which was on Lagunitas' labels, but is in the name of SweetWater's 420 Extra Pale Ale), when things got a bit sour in the form of a cease-and-desist letter from SweetWater. Now, Lagunitas has dropped their use of the term. 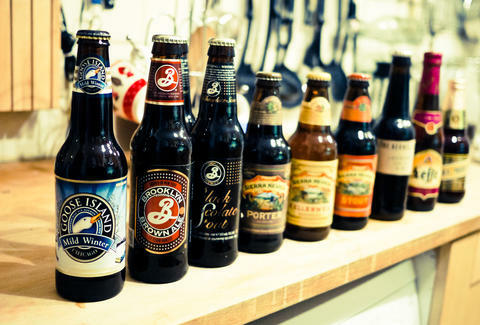 But with wine and beer being considered legally in the same class of products, and since there are over 3,000 breweries in America, there are fewer and fewer options for American craft brewers. Maybe they'll just start using misspelled names instead. Adam Lapetina is a Food/Drink staff writer for Thrillist, and wonders why nobody goes for "barley" puns. Read his musings at @adamlapetina.